The weekend kicked off with a three act gig at The Hothouse in the West End of Morecambe (if you think of ‘the West End’, as in London Theatreland, and then think of the complete opposite, then you’re about there). I don’t think I was really aware of the Hothouse’s existence when I lived in Morecambe, but I was pleasantly surprised, despite its completely unexpected location. The first weekend of June being part of our traditional fortnight-long British Summer, it definitely lived up to its name. It was boiling, and was almost enough to make me question the choice of wearing a corset and a hat. But not quite. Two thirds of the brains behind the whole operation, Rose and Rob, were taking tickets just inside the door, and as soon as I walked in I knew I’d made the right decision firstly by going, and secondly by volunteering. No sooner as I walked through the door I was greeted by a grin and ‘Jo!’. The warm greeting set up the tone for the whole weekend, and it was something that really stood out for me. 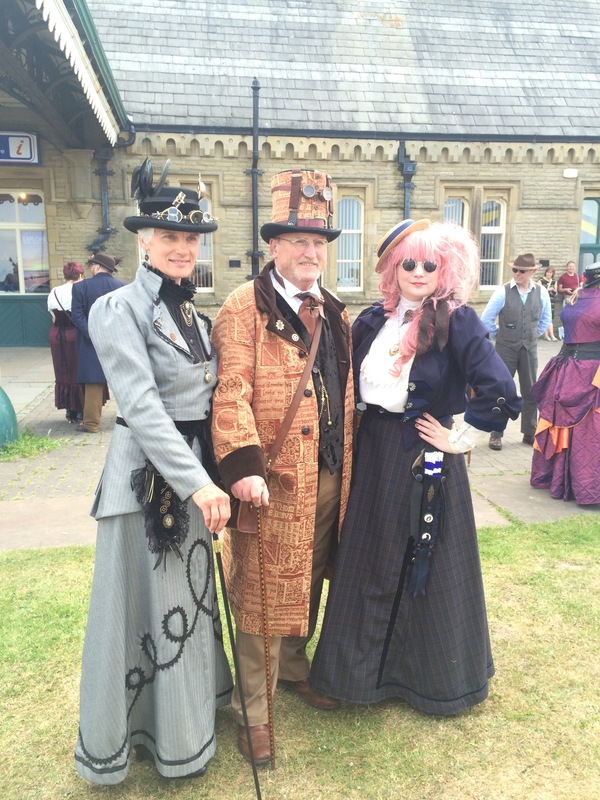 The whole Steampunk community are a mad, friendly bunch, and it really did feel like a community. The room was set up with a dance floor in front of the stage, and a bunch of different sized tables towards the back near the bar. This is where I thank my sister for letting me dress her up and bring her along, because this is not a situation I would like to be in on my own. I’m nowhere near as socially awkward as I used to be, but I still like to have backup. We made a beeline to the only two people there at that point who looked about our age, who thankfully had two empty seats opposite them. We drank, we chatted, we danced (like idiots, later on in the evening, when the music was less suited to the impressive waltzing that was happening earlier on). Out of the three acts who played, I’d only heard of one of them before, but I came away with two new artists to add to my music library. First up, Alice’s Night Circus. I’d seen Alice at the bar and slightly fallen in love with her crazy costume and candy floss pink hair. Turned out she also had a great voice and was a lovely person to boot. I didn’t manage to get any decent photos of her set, but I did get a family shot of her and her parents in all of their finery on the Saturday. Then, Metropolis. A Steampunk alt-rock band is something that I never knew I needed in my life, but looking back I’m not sure why I never knew – considering my music taste it’s exactly the kind of thing I would have been listening to for years if I’d have been aware of its existence. They were great, and we ended up chatting to the frontman later in the evening about everything from how I was supposedly the responsible adult (my sister and our two new friends all being three or four years younger than me) to his day job as a lecturer in game design and what his students think of his black nail polish. I’m friends with him on Facebook now. That’s the kind of weekend it was. And, finally, last but not least etc etc: Mr B. The Gentleman Rhymer. This guy I had heard of before, and I’ve always enjoyed his music. He has a great sense of humour – snarky political commentary masquerading as jaunty faux Victorian hip hop can’t not be my thing. This was the point in the evening where we ended up on the dance floor for a couple of songs, until even I had to admit defeat to avoid passing out from heat stroke. It was one of those great small venue gigs where everyone sticks around and mingles afterwards, so after a chat and a photo with Mr B and various conversations with random people including the frontman of Metropolis and the (by then rather drunk) Victor and the Bully (due to perform on Saturday night and in possession of an amazing umbrella with a solid silver skull at the end of the handle), everyone was dispersing and it was time to go home. This is turning out to be a longer post than I thought, so I’ll break it off here. Stay tuned for part two, involving orange sashes and the BBC! As one of the two people of your age who you came to sit with, accurate.